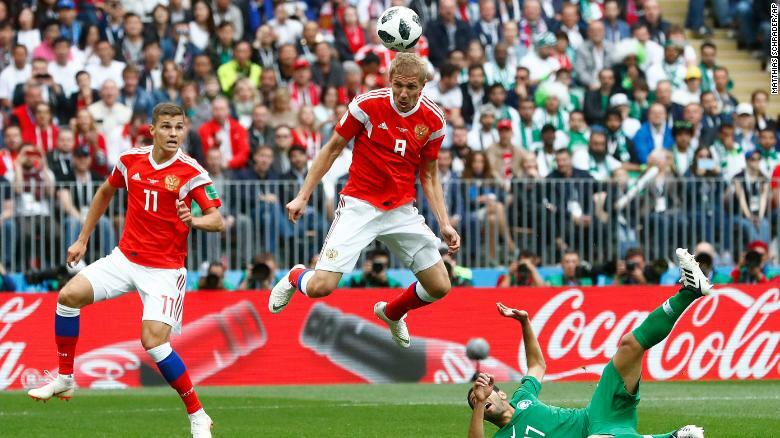 Russia’s Yuri Gazinsky’s header against Saudi Arabia, the first goal in the 2018 World Cup. Yes, of course I sat myself in front of my television set last Thursday at 11am New York time to watch the opening game of the World Cup (the modifier “soccer” is unnecessary, everybody knows what I’m talking about). I was not alone: the forecast is that by the end of the tournament, on July 15th, 3.4 billion people will have tuned in. That’s half the world’s population. I couldn’t help but wonder how many Stoics watched Russia vs Saudi Arabia (final score a whopping 5-0 for the hosts), or will watch any of the remaining 63 games. More importantly, I was wondering how a Stoic should watch them, or even whether he should. Stay with me, it may sound like it, but this is not one of those killjoy posts one expects if one knows little of actual Stoicism (the philosophy) as opposed to stoicism (the stiff upper lip & down with emotions attitude). To begin with, soccer (or football, as the rest of the world rightly calls it) has been the topic of philosophical writings before. Indeed, there is a nice and accessible collection of essays on the topic, edited by Ted Richards for Open Courts, which includes titles like “Nietzsche’s Arsenal,” “Plato and the Greatness of the Game,” “Why playing beautifully is morally better,” “Kant at the Maracanã,” and “Kierkegaard at the penalty spot,” among many others. But there is no entry for Stoicism. Obviously, we don’t have gladiators nowadays (thank Zeus! ), but you get the point. I will, however, argue that these two passages are not about rejecting the enjoyment offered by a harmless pastime like modern football, but rather, respectively, about approaching it in the right way, and keeping it in the right perspective. Before I explain what I mean, let me remind you that watching sports is, at best, to be classed among the preferred indifferents, i.e., the sort of thing that doesn’t make you a better or worse person (despite what some hooligans may think of fans of a rival team). That is, the activity is morally neutral, and moreover, the outcome is most certainly not under your control. As I had to remind myself when I saw Sweden (Sweden!!) eliminate Italy before the Azzurri could get to the final round of this year’s competition. Now, I have come to divide the preferred indifferents into two categories (Diogenes Laertius does something like this in his Lives and Opinions of the Eminent Philosophers, VIII.102): those that can be used well (or badly), and are therefore opportunities to exercise virtue; and those that are completely neutral. My choice of, say, chocolate over vanilla gelato is completely neutral in that sense. But my decision to eat gelato, with a certain frequency, and in certain quantities, is a preferred (or dispreferred) indifferent. Why? Because if I do it infrequently and in small portions I am thereby exercising one of the four virtues, temperance; while if I eat it frequently or in large portions I am failing at the exercise of temperance. I’m not kidding, that’s why Musonius Rufus says that we have multiple occasions to practice temperance every day: one per meal (Lectures 18B.4). So I am going to suggest that football, like any other spectator sport, is a preferred indifferent in the sense that it provides not just entertainment and some needed R&R, but also opportunities to exercise virtue. A bit of rest, relaxation, and entertainment are just as crucial to the human mind as food and water are to the human body, so let’s drop all this nonsense about Stoics not appreciating the good things in life. But we do try to appreciate them reasonably, and in moderation — i.e., virtuously. Which brings me back to the two quotes by Marcus and Epictetus above. Let’s start with Marcus. He is reminding himself that he should not hope for the Green or the Blue team to win, but only desire what actually happens: be glad for whatever team ends up winning, since that was the way the cosmos arranged things, and what’s the point of wishing otherwise? Football is often referred to as a gentlemen’s (these days, really, a gentlepeople’s) sport, because at its best it is about fairplay and the serene acceptance that sometimes you win and at other times you lose (the English version of the mid 19th century did not have referees…). But of course we are not sages, so I very much wanted, for instance, Portugal to beat the crap out of Spain in last Friday’s game. (Don’t ask, it’s irrelevant.) What actually unfolded was one of the best and most exciting games I have seen in a long time, with Portugal going up 1-0 after a few minutes, Spain equalizing, then 2-1 for Portugal, then 2-2 and 2-3 (advantage Spain), and finally 3-3. (All Portuguese goals were scored by an unstoppable Ronaldo.) I was able to channel my inner Marcus and remind myself that one can prefer certain outcomes, but that the virtuous thing to do is to accept whatever happens with equanimity, especially since I had no control at all over the final score. I succeeded, and I managed to thoroughly enjoy the experience as a result. What about Epictetus? What he is saying in that quote is that we should strive not to talk too much when in other people’s company (because we are not as interesting to others as we are to ourselves), and also to try to raise the level of the conversation whenever possible, so that everyone can benefit. Hence the advice not to talk about sport or food, and especially not to gossip. Again, I’m no sage, so I occasionally do talk about sports (I mean, I’m writing a whole post about them…). But I have always recognized Epictetus’ point, before I ever heard of the guy. There is not much sense in over-talking about a game. It’s an enjoyable experience, and it’s fun to comment on it with friends while it’s happening. But doing “Monday morning quarterbacking,” as the Americans put it (referring to the other football) is really rather silly. So I am training myself to speak less (it’s hard for me) and better. You may want to give it a try, it feels more deeply satisfying, at the end of the evening. Practical wisdom (phronesis, or prudence): this is the knowledge of what is truly good or evil for me. Whether “my” team wins or not falls under neither category, which means that I should accept whatever outcome with equanimity. Temperance: I will watch selected games (because too many would use up a lot of time, the only commodity, according to Seneca, that we never get back), and participate in the excitement with moderation (unlike, say, a hooligan who gets drunk, annoys other people, and possibly even smashes things). Courage: to clap for the opposing team, or one of their players, whenever they deserve it, even though my friends and co-fans will give me dirty looks or be embarrassed by my behavior. Justice: treat both the players and the fans of the other team as human beings, members of the same cosmopolis, not to be called names, shouted down or, of course, subjected to violence. Now if you would excuse me, Sweden is about to play South Korea. Go South Korea! This entry was posted in Social living, What Would a Stoic Do? on June 18, 2018 by Massimo. In the U.K. we agree that football is a gentleman’s game, but add the qualifier that it it played by thugs whereas rugby is a thugs’ game played by gentlemen. Leaving aside the class nuances, perhaps we need a Stoic guide for players as well. Interesting post. I must side with the old stereotype of the killjoy in this occasion, as I think that football is a nice game to play and have fun, but it has all sorts of negative connotations as a spectacle for the masses. I am thinking how football is at least in my country a way of proclaiming loyalty to a set of political opinions, always in confrontation with an “other” with opposite views. Most of the time football is an excuse for tribalism , exclusion and violence (even if it is only at a verbal level). I am not surprised that most corrupt political regimes are so keen on the promotion of this game (maybe that is why my country has the teams with the most expensive players in the world). I would love to have a dispassionate view of the game as you have but I certainly can’t so it is better for me to stay away from all this noise. On the other hand as an exercise in equanimity it is certainly a good way to show mastery of the emotions facing a significant social pressure.In any case enjoy the games and have a good time! I watched Brazil play Switzerland of Fathers Day at a local bar with one of my sons (a grandson was unfortunately under the weather). We left before the end, assured that Brazil would prevail. Ha! A lesson in humility. Is soccer a harmless pleasure? What about concussions? I do not pose this question to attack soccer, which I find tedious, but in relation to enjoying a particular sport I love, American football. I wonder if you can virtuously enjoy observing a sport in which you know the participants are subject to serious injury, which they risk for the large sums of money made possible by the advertising you watch during the game. I wonder if I am being immoral by facilitating such risks on the part of the players. And soccer fans should probably be asking the same questions. Seems that more young female soccer players are subject to concussions than young male players of American football. So, Massimo, have gladiatorial combats really ceased in the 21st century? Which squadra are you a fan of (AC Milan, Roma, Juventus)? you raise good questions about concussions. Though I’m not positive about the studies / stats for soccer. I think the problem is far less severe than for American football. But of course that’s an empirical question. Yes, to compare gladiators to modern sports is way of a stretch. Not only modern injuries are rarely fatal, while that was the expected outcome in antiquity, but modern professional athletes are far from being slaves or prisoners of war. I’m from Rome, so AS Roma! This is great! Check out my own thoughts on the competition. I’m also following the world cup and following my teams with joy. Even including negative outcomes in my premeditatio malorum! However, Massimo, there is a point you didn’t discuss; the economic one. I paid a 15 euros subscription to have the TV channels that broadcast the world cup in my area. It’s fair to say that this money would have been more productive in helping sponsor the ships attending the migrant crisis, than in sponsoring the corrupt, inequal FIFA. Also, there is the “sportwashing” conducted by the Russian regime. Aren’t we contributing to the success of that campaign? It’s fair to say that this money would have been more productive in helping sponsor the ships attending the migrant crisis, than in sponsoring the corrupt, inequal FIFA. Also, there is the “sportwashing” conducted by the Russian regime. Aren’t we contributing to the success of that campaign? Both very fair points. My take on that is that similar considerations could be applied to pretty much every aspect of our lives. Did I really need to spend, say, $4.50 at Starbucks for a cappuccino this morning? Would not that money have been better spent on charity? Don’t I purchase things from companies that engage in pretty questionable labor practices, or have been involved in shady international deals? But one cannot live a reasonable life constantly wondering about these things. Awareness is good thing, but too much and one becomes paralized. So my way to handle it is that I try to improve, not become perfect. I don’t buy, or buy only if there are no other options, from certain really villanous companies (like Amazon). And I donate monthly to a group of charities, including one that helps refugees. Could I do better? Sure. But I’m doing something. Great post Massimo! I do remember the passage by Epictetus on not talking about gladiator fights etc.. Given my past conversations were 80% sports related, the passage sure made me feel a bit ashamed! Modern day sports injuries are still a huge issue. Head injuries make the news because they are scarier. People outside of the sports field don’t often talk about, say, knee or shoulder injuries, which are also often career ending and permanent. Now everyone knows that the best way to prevent sports injuries is to not play! However, ask any of the football (or American football) players, they’d hate the most to have their sports taken away from them, because it is what defines them, it’s what gets them up in the morning and they’d put their sports ahead of anything else in the world. Well sure enough, they do put on beautiful performances so others can enjoy watching! Victoria, I feel the only thing in my control is whether or not to watch, but I watch because I have been doing so since one of my earliest memories as a child watching the Baltimore Colts on TV with my dad. I’m just not sure I’m not doing something immoral by doing so. I can’t claim ignorance about the consequences for the players. I also saw on TV recently several former American football players claiming that while there are players who love the game, like the great Ray Lewis, there are many who don’t like it and play only for the money. Eye-opening. Those who watch sports intensely on TV do not partake intensely in them in real life… Or then they are obsessive noodle brain. No “gladiators” today says Massimo? Gladiators got repaired after fights: some were very famous, just as much as tax evading Ronaldo. And had long careers. Sports such as mountaineering, climbing, surfing, suffer a lot of death and maiming, nowadays, among their stars (or even the professionals just below). Because participants do whatever to get paid “corporate sponsorship”). again, I think the analogy with gladiators is misguided. On two, important fronts: (most) gladiators did not do it of their own free will, all moderna athletes do. And the injury or mortality rates between gladiatorship and anything else today simply do not compare. That’s not to say that there are no ethical issues at play, but making unhelpful comparisons doesn’t help. As for Ronaldo not paying taxes, that, of course, isn’t a problem with football, but with the law and its enforcement. You are right. For many, the choice between watching /not watching is probably the only one, especially for America football. I made my previous comment based sporting situation of where I live. 😂 the majority of our athletes are self-funded. Players on many national teams get paid so little that they often need a second job to support themselves (the cricket team for example and cricket is a big sport here, though my stats could be out of date). In an environment like this, only people who really cared about a sport would go into that game.